Keep It SIMPLE - Good...Better, Best Catering! Our package deal is all inclusive, so that you can make your decisions, based on what you do and do NOT like. There is no need for a calculator, no need to compromise, no need to negotiate. The price is set and you can select anything from our menu, no difference in price. You can select a buffet presentation, plated or family-style and the price does NOT change. Delivery and taxes are included. We have all heard the saying, and often times it’s really true, but not with us. You get an awful lot for your dollars especially if you have shopped the market. Our deal simply is unheard of and we are proud of what we offer for your event. time for you to add your personal touches to your decorating. We will prepare and serve appetizers, salad/soup, meal and beverages to your guests, by uniformed and experienced servers. We will cut and serve your cake or dessert. We will serve up to 10% of your guest’s children FREE. 1/2 off for remaining children under 10. We will clean up after ourselves and all kitchen facilities. We will remain on site to refresh beverages until your event ends. 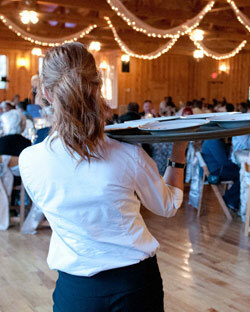 We will clear all linens, dishes and centerpieces from your site.